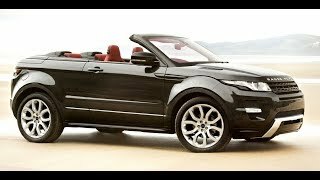 Range Rover Evoque Convertible Concept, first premium convertible SUV, will be unveiled at the upcoming 2012 Geneva Auto Show. As it always has been, the concept cars are used to guage the reaction and potential for the car in a market segment. 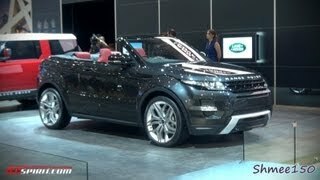 It goes with this Evoque Convertible Concept as well. Land Rover wants to test the waters for the new market segment with this convertible SUV concept. Evoque Convertible concept is based on the Range Rover Evoque Coupe and features a fully retractable premium roof system. The concept cleverly combines capability and versatility with a drop down tailgate and a comfortable four seat package. The vehicle has been developed with Land Rover DNA at its heart, retaining key characteristics including a command driving position and all-terrain capability. 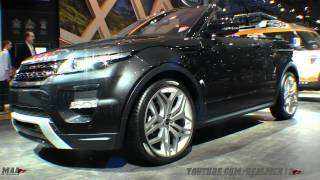 Gaydon, Warwickshire, 24th February 2012 – Land Rover will unveil a Range Rover Evoque Convertible Concept at the 2012 Geneva Motor Show. The Evoque Convertible Concept vehicle will explore the potential for the world's first premium convertible SUV. This bold concept builds on the global success of the Evoque and continues Land Rover's tradition for creating and leading new market segments. The concept is being shown to gauge reaction and to assess the potential for what could be another white space product from the world's leading SUV brand. The concept has been developed by Land Rover Design Director, Gerry McGovern and his team. 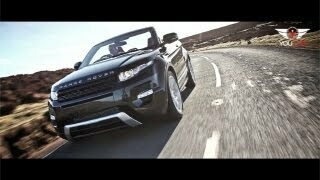 Commenting on the concept, McGovern said: "The Evoque lends itself beautifully to the idea of a convertible. This study is not a traditional convertible design execution - instead we have worked with the balance of the Evoque's lines to retain its distinctive shape and create something that is unique and, we believe, highly desirable." The Evoque's dramatic rising waist line and distinctive shape has been retained and the new convertible body style has been achieved with minimal changes to weight and torsional rigidity. The hood is housed in a neat tapered finisher with the roof mechanism stowed discretely below the belt-line. Inside, the concept is packed with Evoque's award winning technology including Terrain Response, surround cameras, Park Assist and class leading infotainment featuring an 8-inch dual view touch screen and a sound system from British audio experts, Meridian. The Evoque Convertible Concept features unique 21-inch Titan silver wheels and is finished in a new metallic Causeway Grey paint. The interior is in Lunar and Ivory with leather seats featuring sporty perforated panels and Ivory contrast stitching. John Edwards, Land Rover Global Brand Director said: "The Evoque Convertible Concept is a new twist to the Evoque story and explores the potential to further extend the nameplate's appeal by giving existing customers more choice, whilst at the same time reaching out to a completely new customer base. We are excited to see the response to this concept as we assess the potential for building on the Evoque's exceptional success so far."